Night satellite images show that people around the world use so many bright lights to light up the nights as Christmas, Thanksgiving, New Year, and other traditional festivals approach. The excess use of lighting technology to decorate lawns and trees has become so obvious as to be captured by NASA’s space satellites. The use of light decorations are good since they celebrate the moods of festivals and religious holidays, but it should be borne in mind that it also impacts on the amount of energy consumption in each state or country that consumes such lights in excess. Lights are fun to use and they mark the spirit of festivities, but it increases energy use during these festive periods and somehow adds to the release of gases into the air. 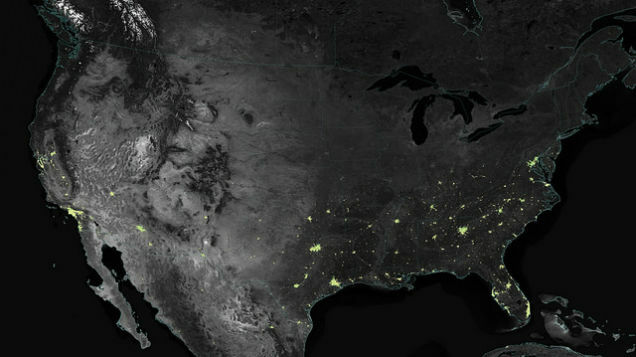 NOAA/NASA satellite data from the Suomi National Polar-orbiting Partnership reveals that night-time lights in metropolitan US states account for 20-50% light brightness during Christmas and New Year celebrations compared to the rest of the year. Most cities in the southern part of the United States brighten the nights with lights and lighting decorations around December that make up for 50% increase in the amount of lighting decorations and brightness versus the rest of the year – leading to about 20-30% increase in lights from urban centers; but the northern parts have not been taken much into consideration in this study because the snow they experience reflects enough light and this mustn’t affect the accuracy of the study. Muslim countries in the Middle East are also taking up this practice of light decorations during the Ramadan period, and since they gather for meals in the evenings and nighttimes, they are also starting to borrow the excessive use of bright lights for decorating lawns and compounds from western countries.